A few weeks ago a new neighbor moved into our back garden. Can you imagine? A beaver! He created quite a stir! Needless to say he got a lot of attention. Everybody came to look at the friendly chap. I just love wildlife and thought this was great. Well the excitement didn't last more than 3 days. The rascal chewed down a tree! Typical beaver, can't leave anything, just has one thing on its mind: build a dam! Couldn't the idiot see that he already had a dam! After seeing seven trees disappearing from around the pond, all neatly chewed off. I just had enough, the garden was being destroyed. The authorities were called and our friendly new neighbor with the large teeth, was relocated to a new neighborhood. Good riddance! 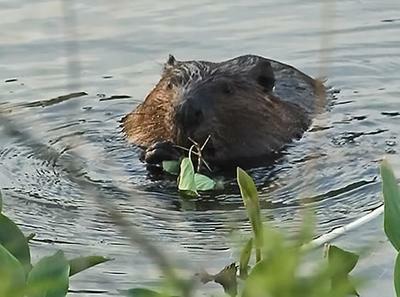 I think the beaver looks quite cute and he is already chewing on a twig. A warning of what was to come? Pity about the blurred branch in the foreground, else it would have been a perfect shot.